Strauss goes on to list all the online course options that people can access, such as Academic Earth. Such online course offerings are amazing, and they can work well for those who are extraordinarily tech-savvy and self-motivated. Who can resist learning on a flexible schedule in which we are all taught by R2D2? Dude, break out the ring because someone is proposing to Robot Teacher! But this romance is going to be rockier than it looks, and Strauss admits as much later in the article. I don’t think robots will take over for professors anytime soon, and not for the reasons you might think. Many anti-robot instructors argue for the importance of human connection when teaching. I’m not entirely convinced of that because I often had my biggest “ah-ha!” moments when reading books in my spare time. So, what’s the one thing keeping robots from taking professorial jobs? Well … have you seen how most people interact with technology? Think about it. All I need to do is say one word: “Blackboard.” And pop on over to College Misery sometime. Many of their posts involve mishaps that unfold when students attempt to engage with technology. 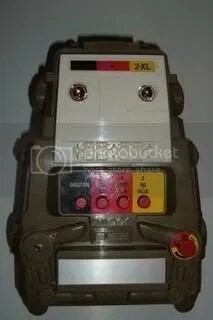 Image of a 2-XL electronic robot toy by the Mego Corporation by PantheraLeo from Wikimedia Commons under a Creative Commons license. If the posts at College Misery are representative of the situation, most of their students couldn’t grab their bits and bytes with both hands in a well-lighted digital classroom. What makes us think they can figure out how to use their computers to learn a subject? I know a lot of people who can’t keep their Flash up to date and who don’t know how to download Acrobat Reader. Will these people be able to get through an online course? Proponents of totally technology-fueled teaching are making a logical leap. Just because a student loves her smartphone, can text up a storm and can construct elaborate music playlists doesn’t mean she can use programs like Blackboard without a little help. For starters, many people use only one or two apps on their phone, and they don’t know much more than that. You’re still going to need a human being around to train people to use nifty online class software. “Not true!” you technophiles might cry. “We’ll create a user manual and add helpful instruction in conversational language rather than jargon.” Hey, I’m a technophile, and I’m all for instruction manuals written in plain English. I’ve written a few manuals myself. But I have sat through enough website usability sessions to tell you that people almost always skip instruction text and just start clicking on buttons until something happens. (and they sure won’t download a manual that’s in .pdf form) They will always call the teacher first before they read the instructional copy. That doesn’t make people dumb or illiterate–it’s human nature for most people to want to solve problems face-to-face. That’s why there are still classrooms. If people didn’t prefer obtaining guidance from a human being, we would have had robot teachers long ago. Subscribe to comments with RSS	or TrackBack to 'Hot for Robot Teacher?'. I think the high volume of complaints about the current standard of customer service–where you often have to wade through a half-dozen automated responses before (maybe) being connected to a human being–says a lot about how much we still value human contact. Even if the trend is toward online courses, I’m guessing most students will still want an actual human being to be teaching them. I’m taking an online course right now and while there are many things I love about it (low cost, being able to participate on my own time, accessibility), I’m still rattled by the fact that I’ve never met my classmates or my prof face-to-face. The occasional Skype chat might help, even though it’s not quite the same. Maybe the next generation of online learners won’t notice as much, though.